Is there someone in your life who has been critical of you? We have all been wounded by hurtful words of others - whether it's the constant nagging of a spouse, an overly critical friend, or a fault-finding parent. At the root of a critical spirit often lie insecurities and unmet needs. For many, critical attitudes are "caught" from a home life where parents modeled this destructive behavior. Whether you feel constantly beat up by the biting words of others or whether you are personally struggling with an overly critical attitude, find out how to respond to harsh criticism and how to cultivate a caring spirit with this easy-to-understand book by June Hunt. Use this encouraging book as quick-reference or as a Bible study. Perfect for those who have been scared by the verbal criticism of others and for those who struggle with being overly critical. 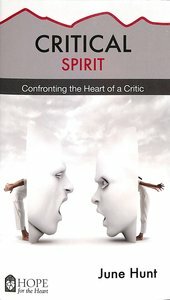 About "Critical Spirit (Hope For The Heart Series)"
Harsh criticismwhether through hurtful words or disapproving gesturescan cause emotional pain, strain relationships, and stunt personal growth. In this 96-page book, June Hunt shows how to respond, heal, and stop the cycle of criticism with the healing balm of the Word of God.